If you’ve been meaning to buy a new pair of general purpose scissors, these Milwaukee jobsite scissors are fantastic and should serve you well. Buy them! I could end things here, making this my shortest review ever, but I’ll throw in some more words about these heavy duty scissors. I don’t remember when Milwaukee sent me both styles for testing and review, but it was some time ago. I have since used then to cut paper, thin plastic, cardboard, rubber, foam, and many other varied types of scissor-cuttable materials. Here’s the Milwaukee heavy duty scissors preview post. I have mostly used these in place of the snips I’d use for general purpose cuts, although I still use snips on tougher materials. Related: Midwest’s Knifti-Cut mini multipurpose shears remain my favorite heavier duty general purpose cutters. Milwaukee offers two different styles of heavy duty scissors, straight cutters (48-22-4041) and offset ones (48-22-4040). The straight cutters cost around $15, and the offset ones around $20. The difference is not just in handle shape and ergonomics; the straight scissors have plain cutting edges, the offset scissors has a serrated blade, which makes them better suited for gripping certain materials while they’re being cut. I can’t say I have experienced slippage with Milwaukee’s straight heavy duty scissors, but the offset scissors should work better on smoother or slicker materials. I like that these scissors have full-metal handles, but that’s pretty much expected for this type of product. I wouldn’t expect them to be like paper scissors from the office supply store, with their metal blades and plastic handles. The grips are quite comfortable. According to Milwaukee, you should choose the straight scissors for their smaller, smooth blades for burr-free cuts and better control when cutting tight corners, and the offset scissors for their serrated blade and offset handles for gripping materials at a comfortable angle. I tend to use whichever pair of scissors I can find, or is closest to me. I have yet to have any trouble with these scissors, and anticipate using them for years to come. If I had to buy just one, it would likely be the offset scissors, for the more ergonomic hand grip when cutting into larger sheets of materials, and serrated lower blade. 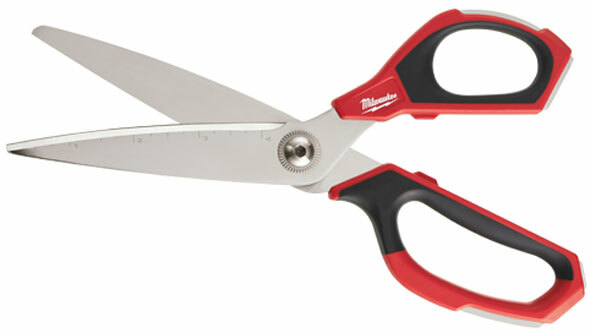 The straight scissors are a little smaller, and according to Milwaukee should result in cleaner cuts. Thank you to Milwaukee Tool for providing the review sample unconditionally. « More Pro Tool Brands Need to Make Cordless Inflators! Oh also when “building” boxes (ie shortening existing boxes) the built-in scale is perfect to know that I’m cutting a 3″ or 4″ flap! Doesn’t have to be that accurate for a quick box modification. 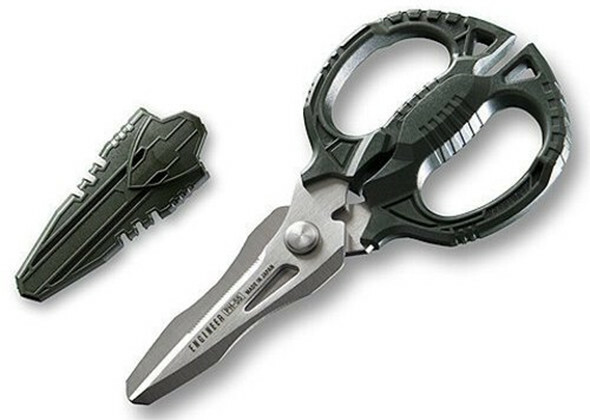 Ive been eyeing these each time I go to HD,I have a thing for snips/scissors i think. I have a pair of the Midwest Knifti-cut you mentioned above too,they are awesome. How do the Milwaukee scissors compare to the Engineer PH-55 Tetsuwan scissors? I’ve put the Milwaukee scissors in my pocket, but don’t recommend it. The Engineer Inc scissors come with a cap and are much more compact. The Milwaukee scissors can do everything the Engineer Inc. scissors can do, but the reverse is NOT true. The Engineer Inc. scissors can fit into minimalist tool kits, while the Milwaukee scissors take up a lot more space. You get better comfort and stronger cutting power from the Milwaukee scissors. Do you want all-around scissors that can handle tougher or larger tasks? Do you want great quality scissors that are more compact and easily carried? If it’s one or the other, the Milwaukee scissors are the better choice. In the simplest sense, they are stronger cutters (due to the length and construction), and are more comfortable thanks to the full-size handles. I still use my Engineer scissors for a lot of things, even when the Milwaukee scissors are somewhere nearby. But they’re not meant for heavy duty professional use. Both brands’ scissors are great. I bought the straight pair a month ago and so far really like them. Very smooth, sharp and heavy duty. For my hands the handle ergonomics are just OK, not spectacular. What I don’t like about them is the aren’t very “sensitive”. For a pair of purely utility/shop scissors this is probably OK. However it can make them less than ideal, for instance, when trying to accurately cut out paper patterns. In that case you really need to feel when the blades are cutting to get the best results. Maybe they just need broken in more, I have no idea. Just a minor quibble really, but something I did notice. For the price however, I think they are a no-brainer. I’m not opposed to buying a $15-$20 pair of scissors, though, so I’m curious how these compare in terms of sharpness and durability? I was gonna buy these for the wife for christmas but i went to the wiess for $20. With a full tang handles they will cut almost anything. I’m an electrician married to a formally trained clothing designer who is a sister to a hair stylist, so I’m fairly familiar with some of the finer points in scissors designs. for general workshop use. Sometimes Fiskars delivers the goods, and this example is one of those times. 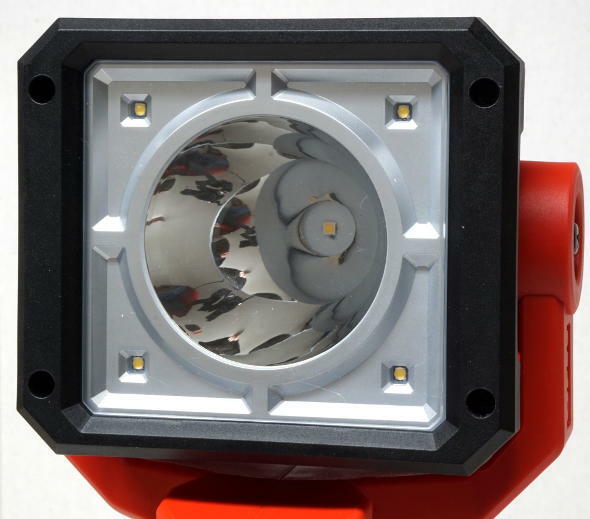 Really versatile and effective for various medium duty type stuff. Also, I have a pair from Oxo with large soft handles and smallish precise blades that I like. Of course, the usual suspects, Knipex, Wiha, Beta etc sell nice electrician’s scissors but not the best fit for all purposes I suppose. As far as the Milwaukee scissors in the above post…I actually cut a pair of the offset type in half with a Knipex Cobalt cutter…guy at work almost demanded I do this, thinking it impossible. Turns out he was wrong(and $20 poorer). 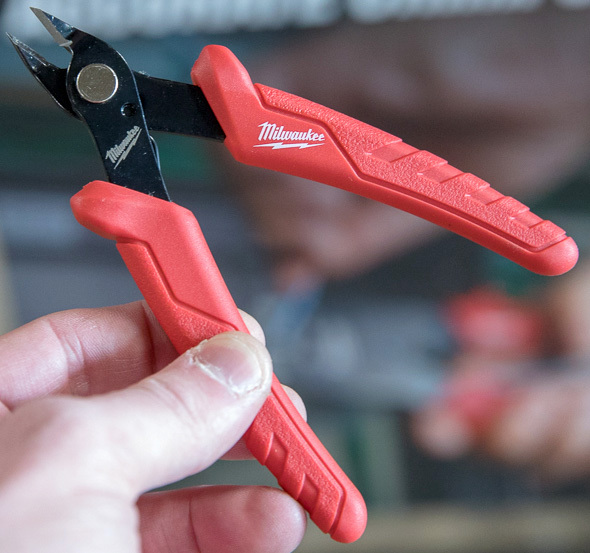 I mean, these Milwaukee’s are OK I guess, but not up to the task of not being cut in half by $50 pocket sized bolt cutters. We’ve all been there. LOL!!! Cobolts are no joke. Heads up, home depot “spring” black Friday coming 4/7/16! Their Spring Black Friday events focus on gardening stuff. According to their press release, this one is no different. It won’t be anything like their BF deals, at least in regard to tools. I’d like to see how they compare to the Wiss Shop Shears I got for $15. I have not had any problems with them. I also have 2 pairs of the Midwest Knifti Cut shears. I also have some scissors I paid $25-$30 for but that I keep with my leatherworking tools and they cut 9 oz leather like the leather wasn’t there. I was at HD yesterday and the sale was already staged. It will include plenty of Milwaukee items, not sure about the scissors. Yes I just cut the clamshell off 2 pairs of Milwaukee pliers w the offset scissors. The clamshell packages where the handles stick out the bottom? I just twist the tools right out. For the full-enclosure types, and any other type of packaging, I usually grab my Greenlee multitool – I mean scissors (PTT03).